The delightfully readable story of The Anatomy of Peace: Resolving the Heart of Conflict focuses on a group of parents who have brought their wayward children to a wilderness program that promises to change the direction of their lives. The program’s leaders work with the parents to help them discover how they themselves must change if their children are to have a chance to succeed. 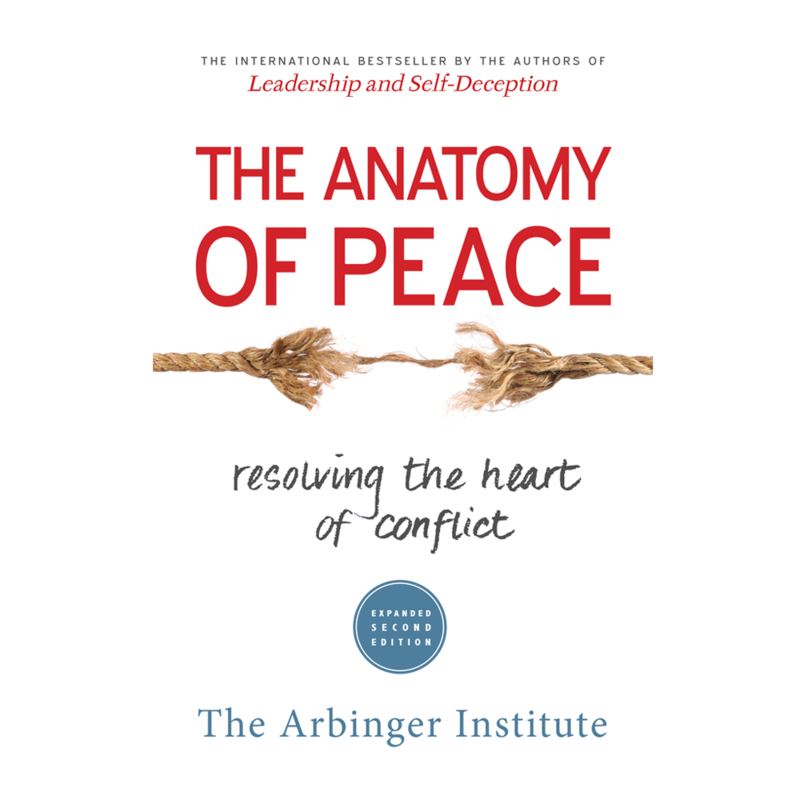 The Anatomy of Peace: Resolving the Heart of Conflict (The Arbinger Institute, 2006) brings us life-changing insights and principles for resolving conflicts, whether they be personal or global in scope. The leaders, an Arab named Yusuf, and a Jew named Avi, who have themselves experienced a transformed relationship, teach that people basically have two ways of being. If we have a heart at peace, we see others as people —with hopes, needs, cares, and fears that are as real to them as ours are to us. If we have a heart at war, we see others as objects — tools to be used, obstacles to our goals, or even irrelevant. When our hearts are at war, we often cannot clearly see the other person’s point of view, and we sometimes act in ways that provoke hurtful behavior — often the very behaviors to which we object. Through personal stories and observations of the group’s dynamics, the leaders point out how our own negative attitudes and behaviors drive us to justify ourselves by seeing others as worse than they really are. As Yusuf points out, “A heart at war needs enemies and mistreatment more than it wants peace” (p. 104). We tend to justify ourselves for our attitudes and behaviors toward others out of four basic needs: (1) the need to believe that we are better than others; (2) the need to believe we deserve more than others; (3) the need to be well-thought of by others; and (4) the need to reduce expectations because of some perceived lack in ourselves. These needs are like boxes in which we are trapped until we recognize their limitations and step outside them to gain a different perspective. If we are truly committed to peacemaking — not just to proving ourselves right, the first thing we must do is to step out of the box that traps us in attitudes and behaviors that demonize others and work for a heart that is at peace. Then we must build relationships, both with others who might be able to influence the situation and with those we have treated as enemies. As we listen to and learn from those with whom we have been in conflict, they may become more open to our attempts to communicate our experience and point of view. When we more fully understand one another, we will be in a much better position to deal with the things that are going wrong and work together to make things go right. The most time and effort should be spent at the beginning steps of this process, which Yusuf and Avi present as a “Peacemaking Pyramid” (p. 211). Individuals, especially those struggling with conflicts in their families, workplace, or community, would benefit from reading and reflecting on this book. A group willing to apply these insights to their own lives and share personal experiences could use this book as a study guide. If you would like to learn more about the Arbinger Institute, which specializes in conflict resolution and peacemaking at all levels and offers consultation and training for organizations, visit www.arbinger.com. Near the end of the book, Yusuf sums up its lessons: “... your, and my, and the world’s hoped-for peace depends most fully not on the peace we seek or the wars we wage without but on the peace we establish within” (p. 224). Jane P. Ives is a United Methodist Marriage and Family Ministries Consultant from Portland, ME.